The Berries are everything beautiful about the Bahamas and Nassau, well it’s not the same. Our 38 mile ride from Little Harbor in the Berry Islands to Nassau on New Providence Island was uneventful. We were approaching Nassau Harbor from the West, the same entrance used by all the cruise ships. Nassau Harbor Control keeps tabs on all comings and goings and it is required to hail them to obtain permission to enter the harbor. The entrance cut is not big and Royal Caribbean, Norwegian, Disney, etc have the right of way. No ships were entering or leaving and permission was easily granted after supplying Harbor Control with our ship and destination information. It was noon on a Friday, one of the three busiest days each week. Unlike main passenger ship harbors in the states Nassau Harbor lets everyone make there way. We saw no Bahamas Defence Force boats around the cruise ships and we were able to get as close as we dared. Our destination was Nassau Harbor Club and Marina. Located on the east side of the harbor we had to pass under two high bridges. 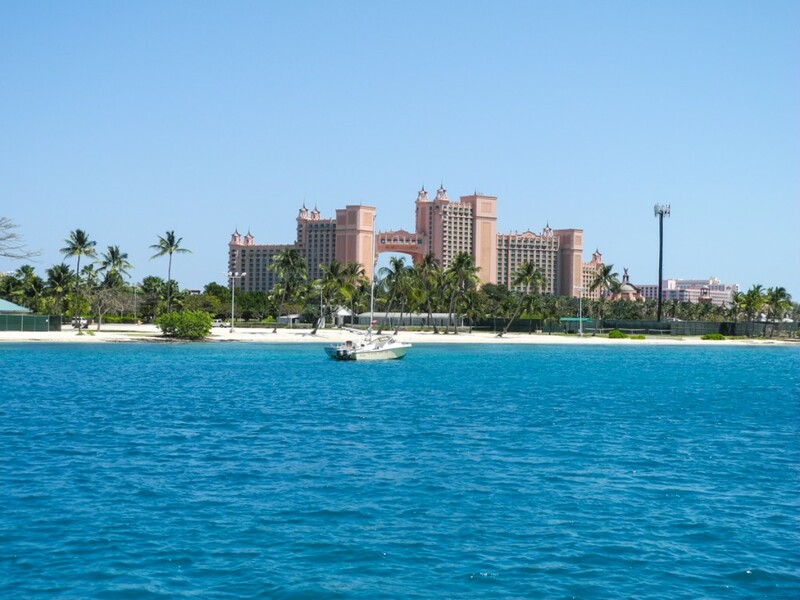 These bridges service Paradise Island and in particular Atlantis Resort. Atlantis officially opened in 1997 but was further developed and expanded over the ensuing ten years. During our week in Nassau we visited Atlantis twice. It is huge. “The Dig” is a series of aquariums located beneath the lobby of the Royal Towers and is the world’s largest open air marine habitat. It is fascinating as is the entire resort. Many parts are closed to the public unless you buy a day pass which we did not. However we found out The Dig is open to all at night so we got to visit it and the casino of course. 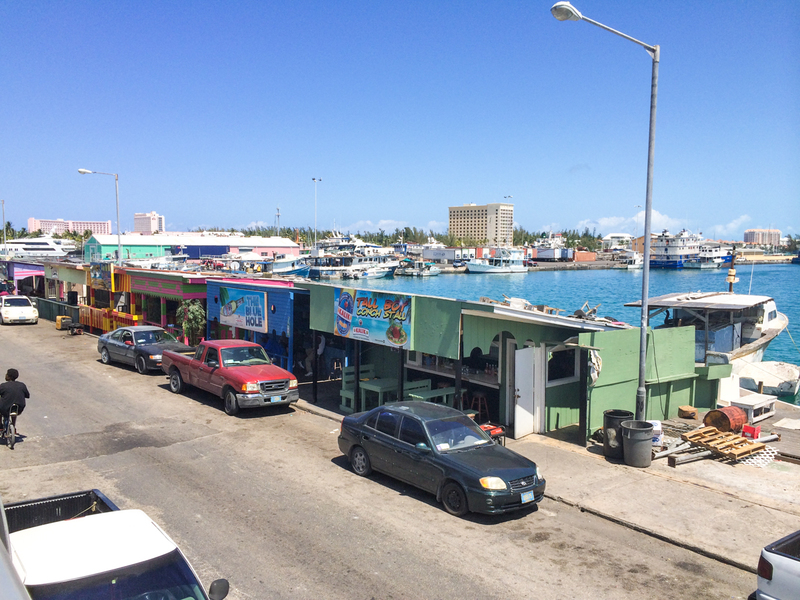 Our marina was perfectly situated across from the best supermarket in the Bahamas. While it was named “Fresh Market” it was not to our knowledge related to Fresh Markets found in the states. It did carry a large selection of food and we stocked up. Our departure from Nassau was delayed as we waited for a part for our watermaker to be flown in. We took full advantage of the delay and did quite a lot of wandering about both on foot and by local bus. The bus (jitney) rides were fun as the bus route layout is a large circle. Your route into town depended on which bus number you chose. We had three choices on the one way road (all heading away from town) outside the marina and all took about an hour to get to the main downtown where the cruise ships are tied. The bus drivers are all characters and play whatever station they want on the radio system. They also take shortcuts as they decide. To get off just shout “bus stop”. Downtown Nassau is a typical cruise ship venue. Duty free shops abound and overweight tourists line the streets. Shops close up around 6 and the buses actually stop at 7PM. 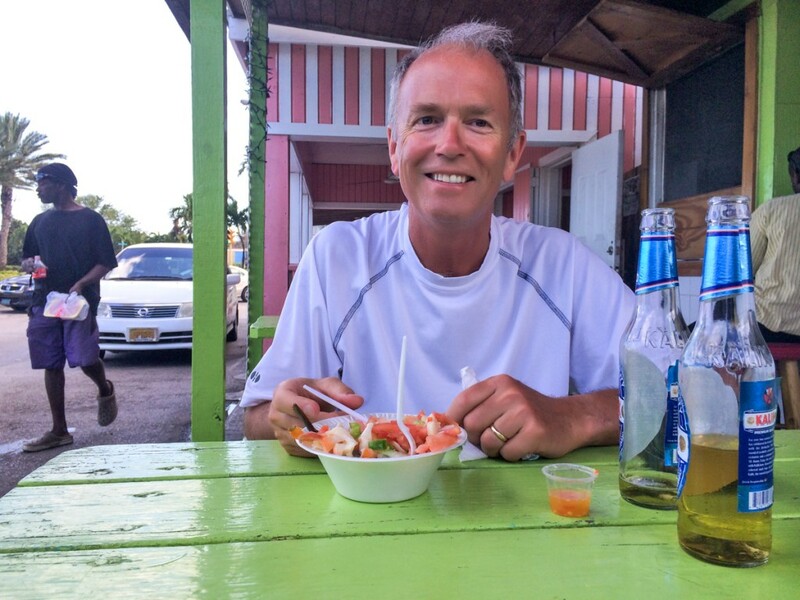 We had read about a foodie tour, Tru Bahamian Food Tours and signed up for a three hour walk and food tasting. It was a great time and we lucked out by having the owner, Alanna, do our tour. In her 20’s and full of energy she provided running commentary and history. She is a Bahamian native who went to college in the states and loves her country. Docked next to us was a sailboat named “Serenity” owned by Mike and Mary Jo. They graciously asked us to join them snorkeling off their boat on a reef outside the harbor. It was loaded with Bahamian reef fish and one shark. Lots of fun. Nassau has a small zoo with gardens named Ardastra. We decided to walk there one afternoon and arrived in time to catch two late afternoon events. 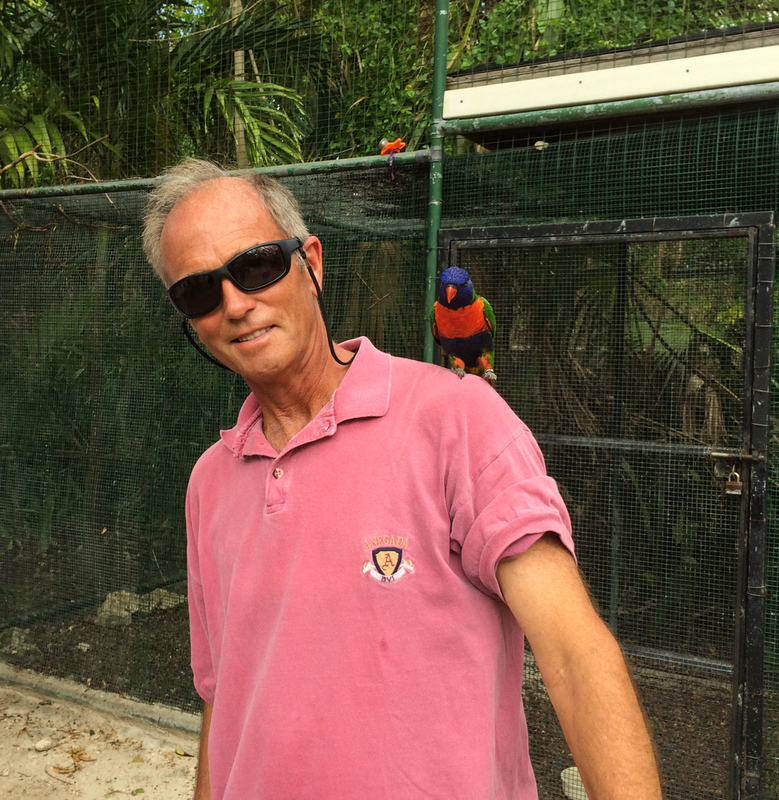 The first was Parrot feeding. After cleansing our hands we were let into a large Parrot cage and given sliced apples to feed to the birds. Hungry and tame they were. 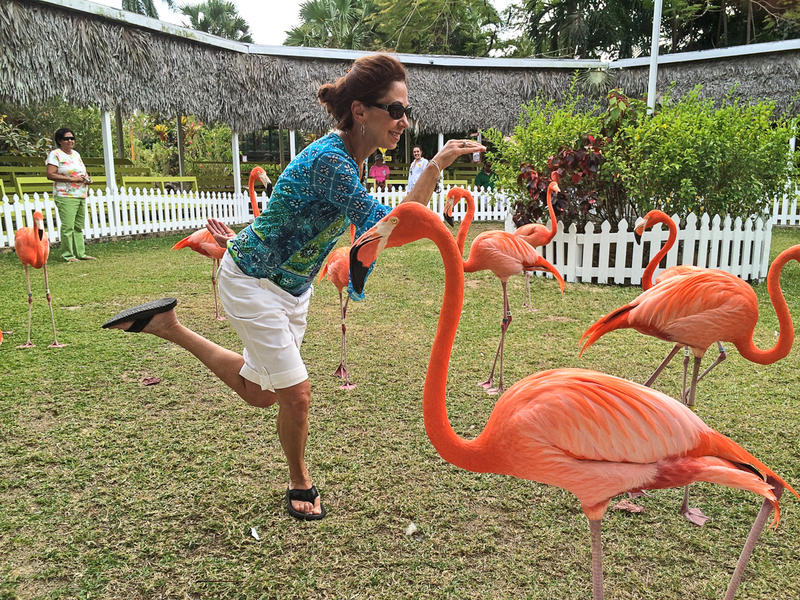 The best event was the trained Flamingos. A zoo trainer paraded and marched them around a ring in near precision timing. He allowed a couple of guests to join and Cath jumped right in. 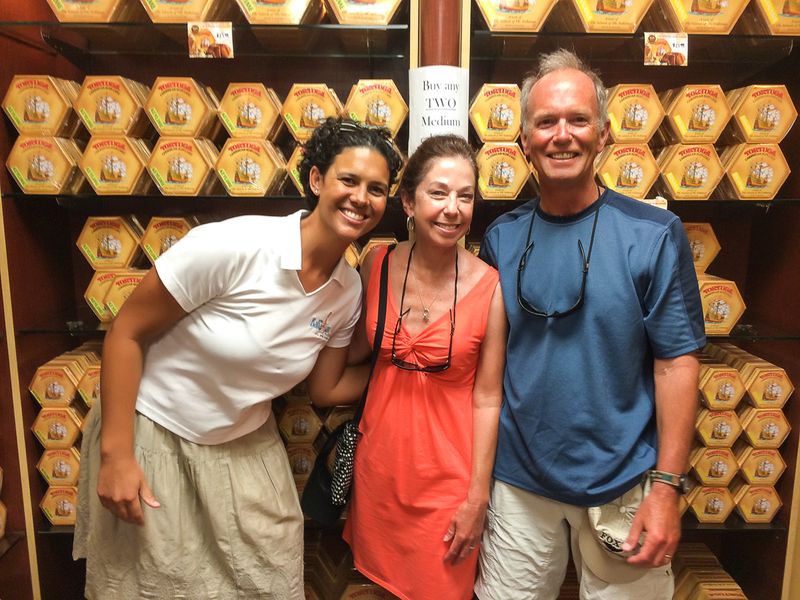 Of course Nassau has a lot more Bahamas culture to enjoy and Potters Cay is not to be missed. It is a huge, noisy and vibrant fish and vegetable market under the exiting Paradis Island bridge. You can buy meals to go or sit and eat at any of the stands. A constant parade of cars cruises thru to look and buy. A great place to experience and eat wonderful food and drink the local beer, Kalik. Our watermaker part finally arrived and I got it installed. The watermaker now works but now there is a seal leak meaning we lose a gallon for every 15 gallons we make. A problem we can live with. 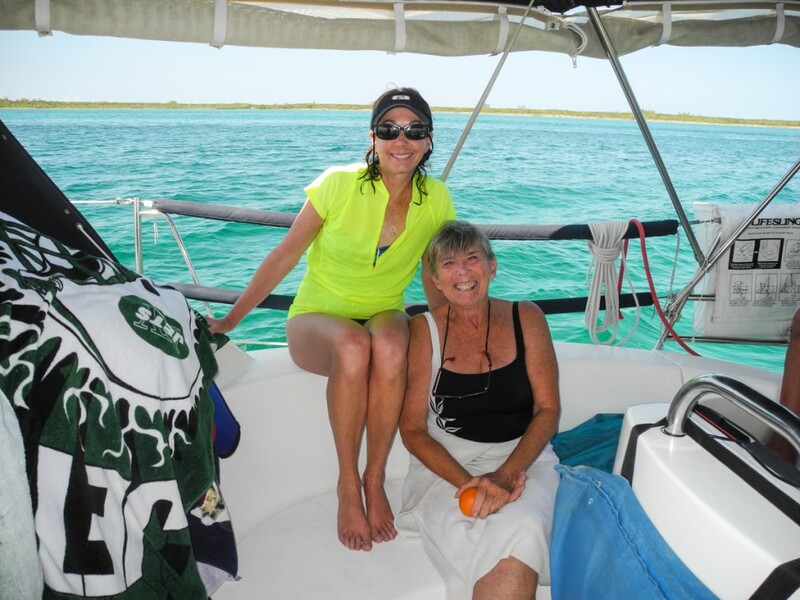 March 29 had us clearing out of Nassau Harbor to the east and on to the Exumas.